Volta is a rocking chair that generates electricity as you rock in it. It was made as a group project in a class called Interactive Seating Design, a pilot Jacob's Institute for Design Innovation course at UC Berkeley. I focused on the user research, product design, visual representation and graphic design, fabrication (milling and welding) and user experience. I worked along side two mechanical engineering students and a math major. We wanted to explore current trends in chair design and eventually create something that could be found in high-end furniture stores. As a team, we spent a day in San Francisco exploring various furniture stores and interviewing representatives about current and future trends in furniture design. We interviewed furniture representatives from Ergodepot, Studioroeper, BoConcept, MScape Modern Interiors and Coup. Taking “inside” furniture out - taking a scene that would typically look like it belonged inside a living room or dining room and turning it into an installation outside. Looking into tension as a form of energy harvesting - What if we had a chair made up of cables that all moved when a person sat down? Implying movement - the “Hag Capisco” chair had a multitude of ways a person could sit on it, and it encouraged the person to move in their seat throughout their seating time. This movement would benefit the health of the person sitting, as well as generate more energy for the chair. Taking multiple materials and using them in new or different ways. We as a team wanted to create something sleek, yet traditional, aesthetic, but also useful. 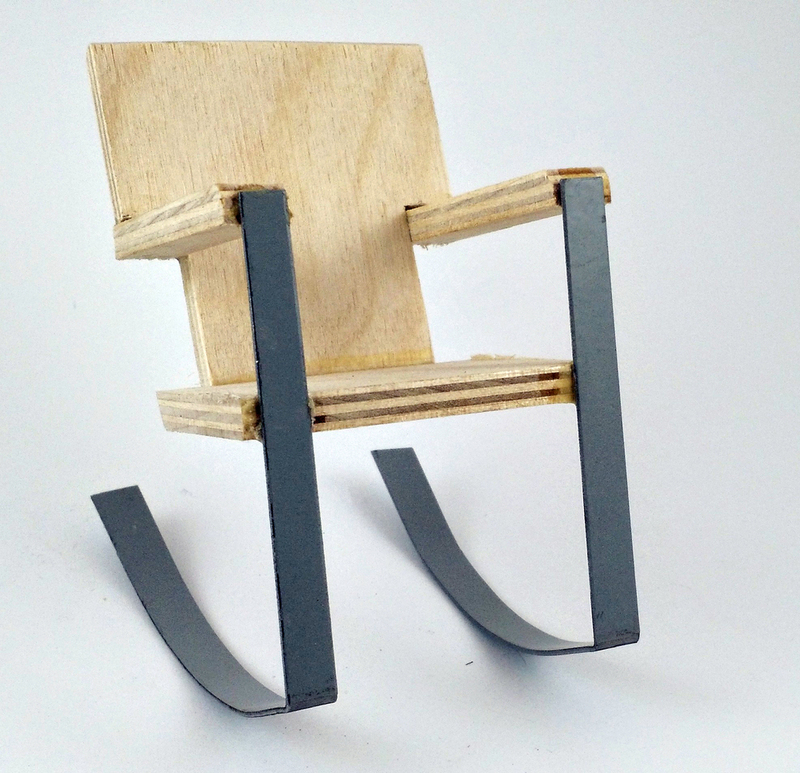 We began by making scale model chairs. It was surprisingly difficult to create the right curvature in the rails to create a comfortable 'rocking' movement. In order to test this, we attached rails and weights to existing chairs, as to test only one variable (rail radius vs chair design stability) at a time. As the chair rocks back and forth, the pendulum turns gears which goes into the motor and generates electricity. The power is then powers the electronics on the chair, including Bluetooth Low Energy, and an e-paper display and outputs the remaining energy through a USB port on the armrest of the chair.